Got a high traffic Wordpress install you want to scale to handle a large number of hits or add in high-availability? Well, Wordpress 3, W3 Total Cache and Amazon's cloud offering makes it (relatively) easy to get a high-availability Wordpress cloud setup that can serve just about any traffic load you throw at it. Building our inbound marketing platform on EC2 made my realize how darn easy it is to create a high-availability site these days (meaning any single component failing doesn't bring the site down) Even just a few years ago this used to take a good bit of IT knowledge to get a load balancer, replicated database servers with heartbeat and auto fail-over set up. 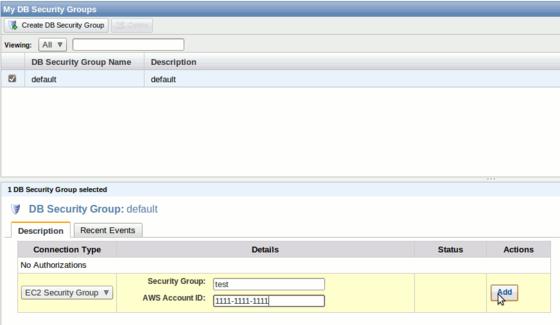 Now it's an hour or so of configuration, most of which can be done from the AWS dashboard. While we primarily work in our own open-source Rails CMS Webiva (which, cough...has multi-server scaling built in...cough) the popularity and simplicity of Wordpress means we still recommend it and are doing installs on occasion, and in this case we needed to scale a site for a new campaign that was going out to an email list of a few million. Given the number of resources sunk into the campaign and the fact that the organization didn't have a good estimate of the traffic or virality of the message, they wanted to be better-safe-than-sorry. So we scaled the hell out of a Wordpress blog for a couple of days - throwing a gaggle of servers, caching and a CDN at it to make sure it could handle whatever traffic the Internet gods decided to provide. This is a rather lengthy tutorial, but if you're interested in this sort of thing I'd recommend following along with a dummy setup to get a sense of the issues involved. We're going to go through this with a fake domain name and fake blog, you can do the same or try to use a real domain name. Provided you don't take too long to complete the steps, you'll only blow a couple bucks max. Prerequisites: An AWS account, access to a SSH client, some familiarity with Linux, and ability to modifiy your /etc/hosts (or wherever it is in windows) file for testing purposes. Your monthly costs for this sort of set-up will depend on the number of instance sizes, but you'll be looking at a minimum of the equivalent of 4 small instances + a load balancer for a High Availability setup, so expect to drop at least $270/mo in EC2 costs, in addition to bandwidth costs, so it's not cheap, but it's still less then a few dedicated boxes most anywhere else. If you want to cheaper - you can skip the RDS server and just host the Mysql database on one of the EC2 instances - but you'll lose the high availability of a multi-az RDS server. Get yourself a Amazon AWS account, you can signup at aws.amazon.com, and enable access on your account to for S3, Cloud front, and EC2 and put in a credit card so you can get started. You'll need to activate each service to be able to do so. Not doing so ahead of time will probably cause some confusion later in the tutorial. 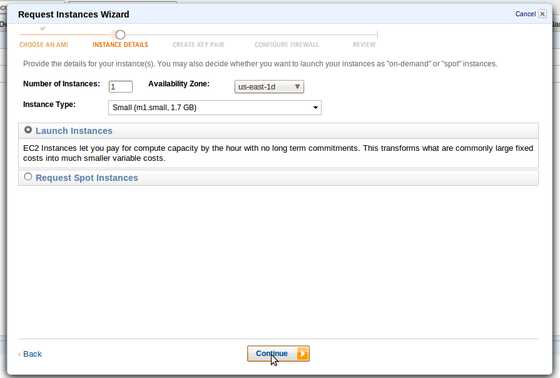 Alright on to the real stuff - first step is to login to the AWS Ec2 console from the aws.amazon.com page. We're going to launch the RDS Database first as it takes a while to start-up. You can leave the management options as they are - just click 'Continue' on the next page. 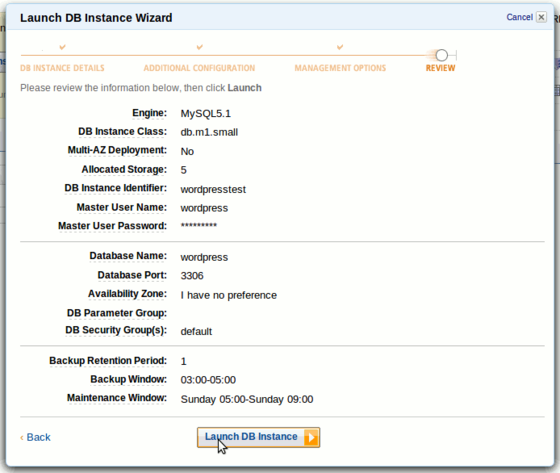 Everything should now be all set, click 'Launch DB Instance' to launch the server. First add the 'EC2 Security Group' we set up, you'll need the security group name and your AWS account id - which you can find in small type the top right of any account page after you log-in to aws.amazon.com. Next select 'CIDR/IP' and cut and paste the address of your current machine (which is nicely shown below the text box) and click add. We're going to start up a Ubuntu Server AMI. 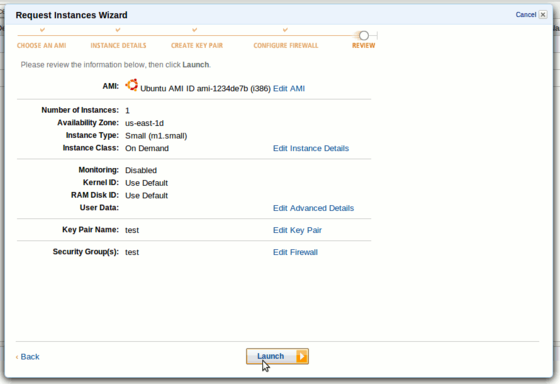 For available Ubuntu Server AMI's, the Alestic AMI's are the way to go. Check-out the Alestic site for available AMIs - you can click on the availability zone you want to pull from and pick either a 32-bit or a 64-bit EBS boot Ubuntu server AMI. If you are only going to run small or medium instances - you can go 32-bit, but otherwise you'll need a 64-bit image. To test this out, it might be worth testing with a couple of small (32-bit) instances so you don't blow too much cash trying stuff out. 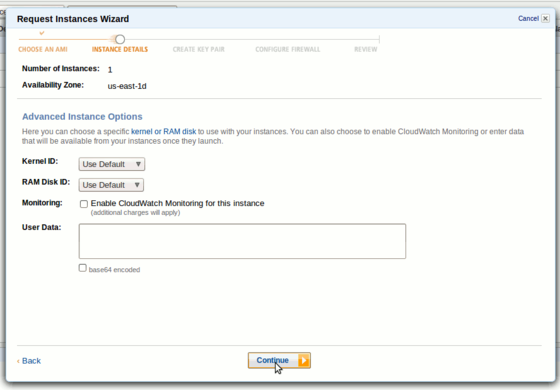 From the EC2 Dashboard - click on 'Instances' and then 'Launch Instance'. Click on 'Community AMIs' and then paste in that AMI id 'ami-1234de7b' into the search field and click 'Select' once you find the AMI. Launch a single small instance for the time being in 'us-east-1d' and click continue. Use the default Kernal ID and RAM Disk ID, so you can just click continue on the next page. This will download a 'test.pem' file what we will use to login to the machine. 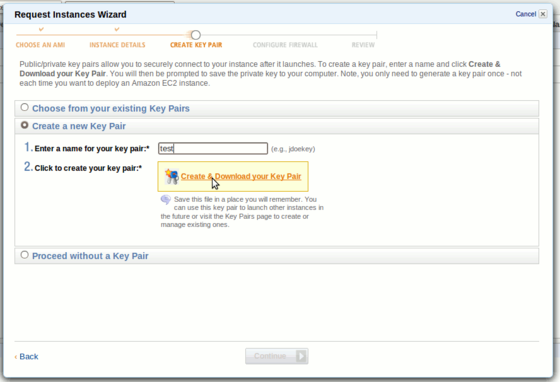 Keep this file handy (and safe) as it lets you login to your EC2 machines. NOTE: If you lose your .pem file you are in a serious bind as Amazon does not, I repeat not, store them. Make a copy and put it in a safe place. The dialog looked a little strange for me - but you should be able configure it correctly. Once the machine is up in the running state we're going to add an 'Elastic IP' to the machine so that we'll have a IP address we control and can move among machines as necessary. 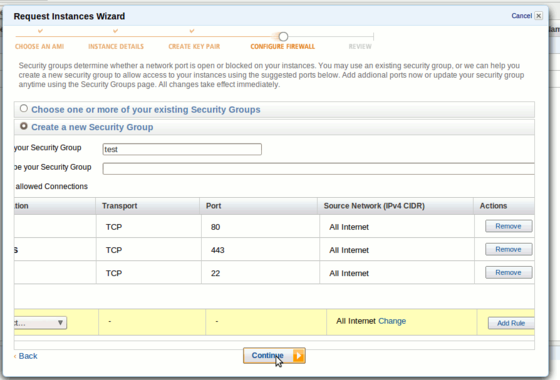 To do this, from the EC2 Console, click on Elastic IPs on the left panel. Next click 'Allocate New address" and confirm that we want a new address. 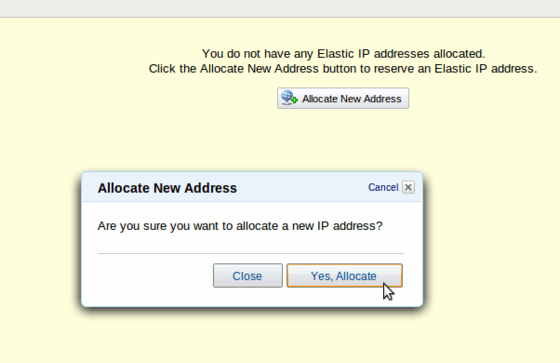 Now check the box of the new IP address that shows and click the associate button. 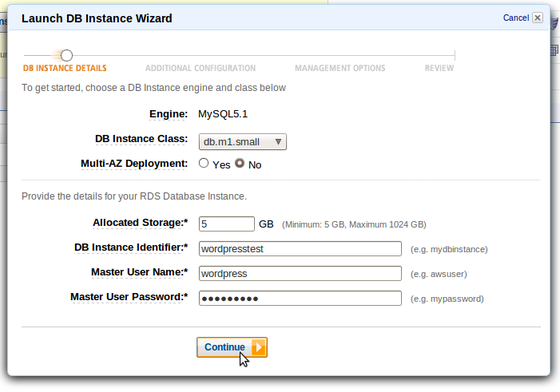 Select the instance we just created and click associate. This will change the public DNS of the running instance, but it takes a couple of minutes to update. When the postfix options come up, just press return twice. Just to make sure everything is config'd correctly let's try to login to our RDS server with the mysql command line tool. 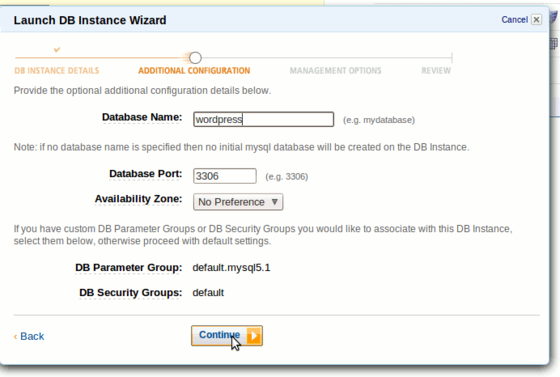 Find out your end point name by clicking on the 'Amazon RDS' tab and then on the 'DB instances' item on the side. Once your RDS instance is in the available state, you'll see a 'Endpoint' column with a hostname to use for the db. If everything is hunky-dorry you should be presented with the mysql prompt. If not, check the security group stuff above. We're going to install wordpress on our EBS volume, which has about 14 GB of free space. 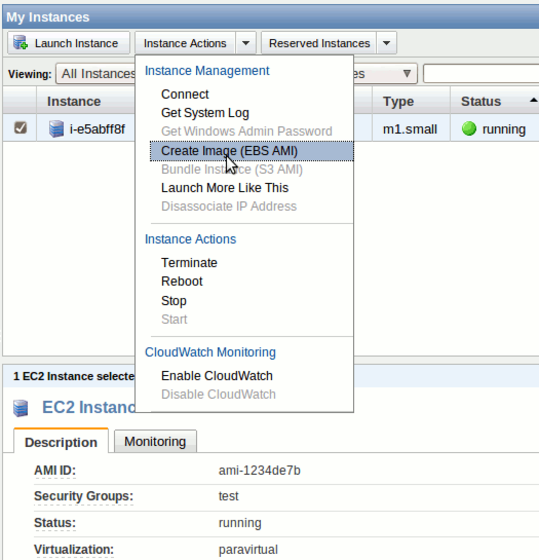 EC2 EBS instances have two types of storage - EBS and Ephemeral storage. The EBS storage sticks around, while the Ephemeral, like it's name says, doesn't. If you have a lot of image or media files, you may need to use the ephemeral storage for your media, but be aware this doesn't carry over into your snapshot. If everything is setup correctly you should be presented with the option to create a wp-config file, click 'Create a configuration file' and then "Let's go" and fill in the info based on your database name, master user name and password and use your RDS "EndPoint" as your database host. Click 'Submit', and if everything is correct you should be ready to go. If it all went ok, you should be presented with a success message and the option to 'Run the install', which will take you through the one step necessary to set up your wordpress blog. Congratulations! You now have a functional cloud-hosted wordpress install. We've only got a couple steps left to make this scalable - we need to set up s3/cloudfront support, set up a load balancer and create a couple of clones of our server. Jump down to step 6. Step 7: Setting up S3 support. Now go into your Wordpress admin backend and click on 'Plugins' and activate the 'W3 Total Cache' plugin. Then click on 'Settings'. Quick note: the reason we use Memcached everywhere is that we need to support multiple servers - if you are on a single server and your configuration allows it turning on "disk enhanced page caching" will actually result in better performance as it will write static files to disk where it can and then serve them with apache, obviating the need to hit PHP at all. Now follow the prompts at the top of the page to upload your wp-includes, theme files, minify tiles and custom files. You can now hit the "Deploy" button to deploy your changes and check your site from the front end (using the public DNS name) to make sure everything is working as expected - you should be serving all your assets off of the amazon CDN. We're now going to put in a little server name hack - the goal of which is to allow our wordpress blog to be served off of multiple hostnames - one for the front end and a different one for the backend. We need to do this so that we can be sure that the admin panel will only use one server to upload files from the backend, so while the front end will serve off of the load balancer, the back end will serve off of 1 specific server. The reason for this is that we want media uploads to stay on a single server. We're going to put in a little apache2 mod_rewrite hack as well as well as a use a simple plugin to make this happen. Note: this is the only part of the set up I really don't like - if someone else has a more elegant solution please point me to it! Some other options include turning on stickiness in the load balancer and running a background cron to automatically copy files between all your servers. This, however makes it more difficult to easily bring up and down servers. 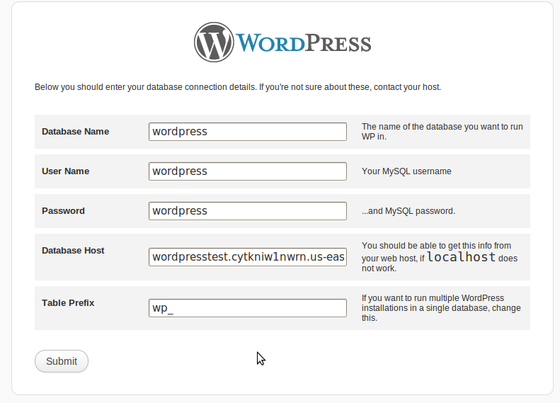 Now activate the module from the wordpress from the plugins page. For now, just open up your /etc/hosts file and add in the following entries (replace myblogname.com with whatever you'd like to use for name - since we're editing /etc/hosts you can use any name, including one you don't actually own) Replace 204.236.234.251 what whatever your server's IP address is. This will automatically kick us over to admin.myblogname.com when we go to login or hit a page in the admin section. There's one slight kerfuffle in the way memcached is configured - it's currently set up to use the server at 'localhost'. While this is fine for now when we only have 1 server, it's not going to work as we scale out to multiple servers. What we're going to need to do is put 1 or more actual ip address or domain name's into the memcached server location so that any servers we add will talk to talk to the same set of servers, otherwise cache expiration won't work correctly. And comment out the line that says '-l 127.0.0.1' (line 35 in my case) by putting a # in front of it. Since we have Memcached set up as the cache for a whole bunch of pieces you'll need to modify this setting in a bunch of places. Which is the private ip address + the port that memcache runs on by default. Enter this value in the approriate fields under the following subpage in "Performance" and click 'Save Changes' on each page. When we scale extra servers all those servers will hit that one memcache server for their cache. If you have the traffic to make it necessary, you can add in multiple memcache servers to distribute requests - the system will automatically pick one of the servers based on a hash of the key value. Now while you're in there, truncate your /home/wp/logs directory so you don't get any stale data in your EBS image. 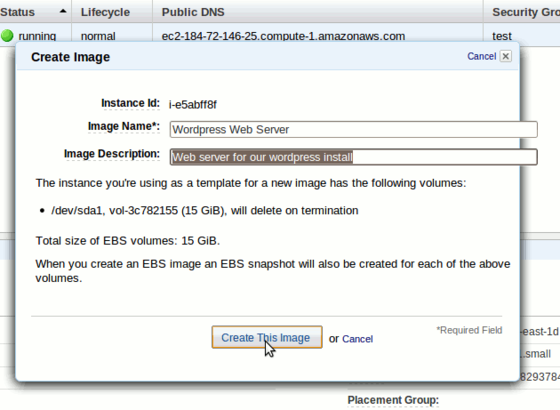 Step 9: Creating a EBS image of our server. We're now ready to create a snapshot of our server, and turn on multiple servers. If you've been following along just to play around with this - I've got a little bit of bad news, unless you actually modify the DNS of www.myblogname.com or whatever domain name you are using - you're not going to get to see the full wordpress cloud in action. The reason for this is that you'll need a proper CNAME record point from your blog domain to the load balancer. You can fake it though if you like - just point the name of your blog to the name of the load balancer and update your wordpress site name. Ok, let's set up an ebs image to let us run multiple copies of the server so as to easily scale our site. From the AWS EC2 console, click the checkbox on your EC2 server and select 'Create Image (EBS Image)' from the 'Instance Actions' dropdown, follow the prompts to create a snapshot. Once the snapshot is done, we can launch new instances of our server with the click of a button. Click on "Launch Instance", then the "My AMIs" tab and you should see your AMI bundled up nice. Click select, then select "2" for the number of instances and press continue, and follow the prompts, making sure to use the same key pair and security group as when we launched the first time. Finally click "Launch" to launch the new servers. If this were a production cloud, you would want to make sure you balance the servers out between multiple Availability zones (like us-east-1a and us-east-1b) so that a problem or internet connectivity issue in a single zone doesn't take down you site. We're going to associate the new servers with their own 'Elastic IP's" as well - so follow the same steps as outlined in step 3. The reason we want to us Elastic IP's is that when we set up a round robin DNS we want to make sure that we don't lose an IP address that we have associated with our site when a machine goes down. While we're waiting for those servers to start up, let's create a load balancer - click on "Load Balancers" on the left column of the EC2 console and then click the big 'Create Load Balancer' button. Give the balancer a name (doesn't really matter what it is) and click "Continue"
Set the ping path to '/readme.html' (or any other static html file) and leave the rest of the options as is and click "Continue" again. Check the boxes next to your 3 servers and click "Continue" one more time. Finally click "Create" to finalize the creation of the load balancer. Once that's working, and if you're doing this for real, set the DNS of your www.myblogname.com to point at your load balancer and myblogname.com to round robin at two of your elastic ips, and you be off and running with a high-availability blog setup. 2. The admin server hack - forcing uploads to a single admin server is not ideal. It would be nice if files could exist authoritatively on S3 to avoid this and so that in the event of the admin server going down, all the files wouldn't have to be manually pulled from the bucket. 3. Updates are painful in general. Since taking a snapshot to create an AMI takes down the server you are snapshotting, you need to do the following steps to refresh your AMI: create a new server from your old AMI, push all the updates and all the files to the new server manually, take a snapshot of that server. For a site that's going to spend a long time on the cloud and isn't just a temporary deployment (like ours was), you'll need some additional tools to keep everything up to date without a lot of manual hassle. In the end the campaign went off without a hitch and the setup handled the pressure no problem - once the initial spike was over we dropped down to two severs for the duration of the deployment. Wordpress properly configured with Total Cache is a beast, able to handle a ton of traffic even without scaling beyond a single server, but being able to easy add additional servers with a single click (or with auto-scaling) is a big plus. You'll be able to scale just about as far as you could ever need to with this sort of setup simply by upgrading the size of your EC2 and RDS instances and adding more memcached servers. At some point you could reach a theoretical limit based on your RDS database, but without without a huge amount of database writes this would be a pretty darn big number. What's next: This is actually just the first of a series of posts on deploying to the cloud. The next post will be a (even more lengthy) tutorial on how to create a repeatable cloud infrastructure with Ruby and Chef that solves the three major problems outlined above. Subscribe to our RSS feed or follow us on Twitter @cykod if you're interested.